Now look, I don’t know if you watch The Walking Dead on television or if you’re into zombie movies like Night of the Living Dead, REC, Dawn of the Dead, World War Z, or 28 Days Later. I am not sure if the idea of a once-dead human being rising from death to be “alive” again intrigues you or if it just plain freaks you out. Regardless, it’s appropriate to talk about zombies, because the story of Lazarus is a zombie story. So it is only a few weeks away from when we talk about the death and resurrection story of Jesus, which also is a zombie story. That’s why most people think of the Lazarus story as just a prequel to Jesus’ resurrection story. I’ve said before, however, that when anyone projects things and ideas onto the scripture stories, one can go to crazy extremes. So how about we just read the Lazarus zombie story as it is and then go from there? I think we’ll find more meaning and hopefully more inspiration to live as more loving and compassionate human beings…who are alive. It is also my hope that we’ll be creative people who use our brains; after all, so far no one is actually eating anyone’s brains. He was from Bethany, and his name means a Galilean. Why should you care? Well, Jesus was a Galilean and the Galilean Jews represented a particular ideology and world view. The short version is that the Galileans weren’t in love with the Roman Empire or the religious temple system. You see, when we talk about “the Jews” in a NT context, we don’t just mean the people who lived in “the Holy Land-Jerusalem” and that they all believed the same things. “The Jews” were [and are] a diverse group of people—geographically, culturally, and religiously. Galilee was a northern province. Judea was a southern province [where Jerusalem was]. Galilee, the north, was more diverse ethnically and culturally due to the Assyrian conquest in the 8th century B.C.E. The influence of other religions and cultures [Hellenistic] was widespread. Galilee was separated from Judea by…Samaria. Politically, Galilee was set apart from the rest of Judea, resisting Roman rule. Galilee was also a major place for resources—good fishing and agriculture. Galileans also spoke a unique form of the Aramaic language. Imagine Jesus with a thick accent in which he drops consonants from the end of words. And religiously, Galileans were not thought of highly by their Judean neighbors to the south. They were far from the religious epicenter of Jerusalem, they did not maintain as strict or strong Jewish traditions, and they were definitely influenced by the Greeks. This is all very, very important in the story. Jesus, from the north, was not considered by many Judeans to be as religious or culturally relevant. He was not accepted overall in the south as a great prophet or teacher. It is in this context that we meet Lazarus, who happens to be sick. Actually, the word in Greek for sick is better rendered as lethargic or weak. Lazarus was pretty much like a zombie. Then John’s Gospel reminds us that those of us reading this in 2014 in the United States have some work to do. Verse 2 of this story mentions Mary, the one who anointed Jesus with perfume and wiped his feet with her hair. Turns out the zombie Lazarus is her brother. The story of Mary anointing Jesus’ feet with perfume hasn’t happened yet. How come John’s authors assume we already know that story before it’s told? Friends, this is yet another example as to why I argue that we need to read Bible stories as they are in their literary, social, and historical context. John’s Gospel isn’t for you and me. It was written for a specific group of people who already knew the stories and were now getting a different interpretation of them. So as we read this, let’s walk in their shoes and enjoy it even more. Lazarus was as sick as a zombie. Uh…Judea? The south? They just escaped from there and barely! Are you crazy? But Lazarus was Jesus’ dear friend, and according to him, there was still the light of day with which to walk. So why not? Lazarus was just asleep, so why not wake him? The disciples understood…or did they? But Jesus was referring to death and then the life that would come after. It seemed like the only disciple who got it was Thomas, who assumed that if they did go to Judea, things would not end well. Sure, Jesus, let’s all go to see Lazarus, so we will all die. Man, that’s a bit depressing. But the story throws us for another loop, because apparently, Thomas and the others didn’t go. Jesus alone eventually makes it to Bethany to see Lazarus. Maybe he followed the smell. You see, Lazarus had been in the tomb for four days. The professional Judean mourners were already there. Mary stayed with them and Martha went to meet Jesus. An interesting dialogue occurred. Martha was convinced that if Jesus would have come earlier [i.e. NOT hanging out and partying for two days with the disciples in Galilee-Vegas], for sure Lazarus would not have died. Then, she affirms her generic religious response: I know that he will rise again in the resurrection on the last day. But that’s not what Jesus was saying at all. He was saying: Your brother Lazarus will rise…TODAY. Martha’s religious dogma and doctrine was set. Resurrection in the last day? Check. Messiah, Son of God, coming? Check. But it was all in the future and tied to tradition. If you had been here earlier, my brother would not have died. Uh-oh. Mary wasn’t sneaky enough, though. The Judeans followed her to where Jesus was. Would there be a fight? No, actually. Jesus saw everyone’s great sadness. He empathized. He cried, too. But he was more than just sad. He was angry, too. The suffering was real. Jesus did not ignore it. But, in spite of Jesus’ empathy and compassion, some still wondered why he didn’t come earlier. Time to go find Lazarus. The tomb was a cave and a stone lay against it. Caves were metaphors for transformation or metamorphosis—kind of like the caterpillar’s cocoon. Take away the stone, says Jesus. Martha is hesitant to do this now, because, um, it smelled bad and apparently they ran out of incense. But Jesus didn’t care. As the people moved the stone, Jesus prayed. Then he shouted: Lazarus, come out! At this point in the story, Lazarus is actually no longer a zombie [tired and weak], but more like a mummy. He was still wrapped in burial cloth, after all. Unbind him; let him go. Indeed. Unbind him; let him go. Throughout the whole story, Martha, Mary, the disciples, and the Judeans were limited by their understanding of life and death; they were limited by their religious views and socio-political conditioning. In short, if someone was dead, he/she was dead. End of story. If someone was poor, it must be meant to be. If someone was limited by gender, language, culture, or geography—so be it. Everyone thought that Lazarus was a zombie, but they were the zombies. They were conditioned [even brainwashed at times] by their experiences to think that their own humanity fit into someone’s category and that G-d’s great mercy and love were meant for only a select few. But Lazarus emerged from his cave-cocoon with life. What they thought smelled awfully like death would now smell like sweet perfume. It was up to the people in the story to unbind Lazarus. They had to let him be free. Man, do we need to hear this. How many people do we bind in this world—limiting them? How many people do we write off as dead and useless? Or help them unbind and free themselves. And how much do we notice our own zombie tendencies in day to day life? Are we fatigued, weak, lethargic? If only you had been there…maybe this wouldn’t have happened. Where are you, G-d? But their suffering [and ours] is real. Living as fully human, we can stay in that moment of suffering and get angry, sad, and upset. Ignoring the our own suffering and the suffering of others will fool us into thinking that we’re all meant to be zombies. We’re meant to live as resurrected people…and now. So how will you unbind yourself and let go this week? Who will you help to unbind and be alive? 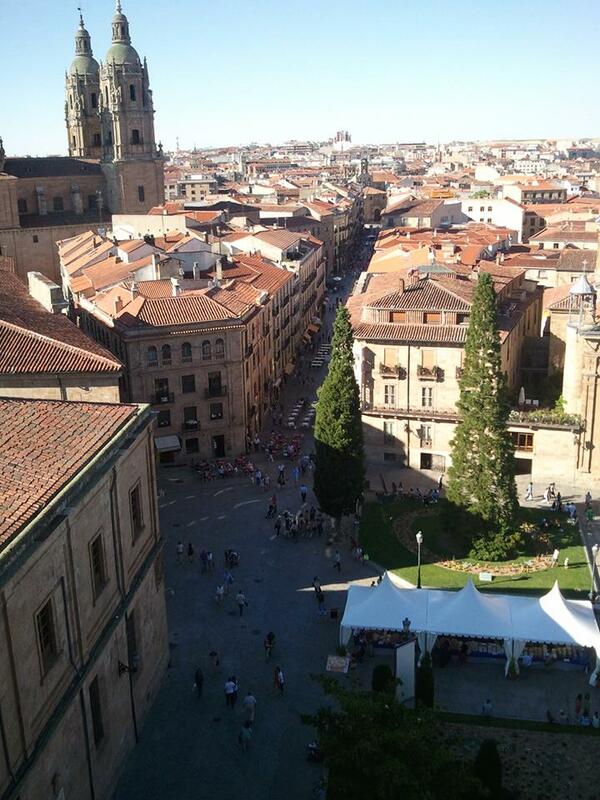 Salamanca, Spain is an amazingly beautiful city that impacts you the moment you arrive. It’s incredibly old and historic, but also quite modern and it is a city truly never sleeps. 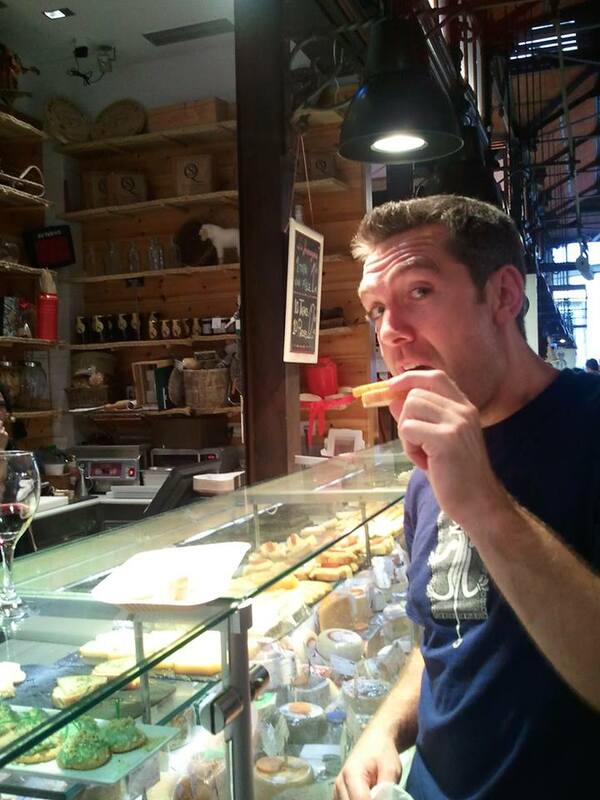 The people of Salamanca have a different rhythm to their lives which I find quite refreshing. They take time to sit and eat. 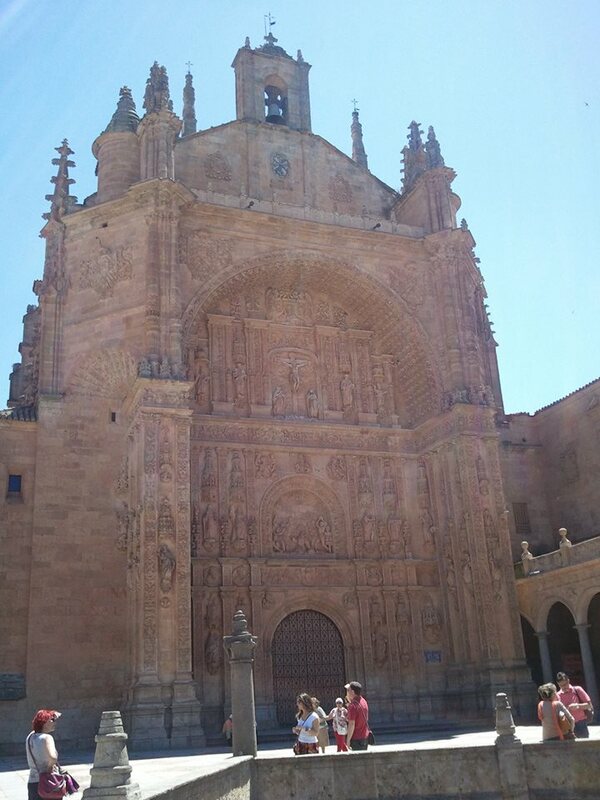 Unlike our U.S. obsession with fast food, drive-thru service and to-go boxes, the people of Salamanca take their time. From 2pm to 5pm, most people go home or to a café restaurant to sit and enjoy food and drink. There is no eating at your desk or microwaving some strange concoction that you will devour in five minutes and call that lunch. They sit and eat real food. 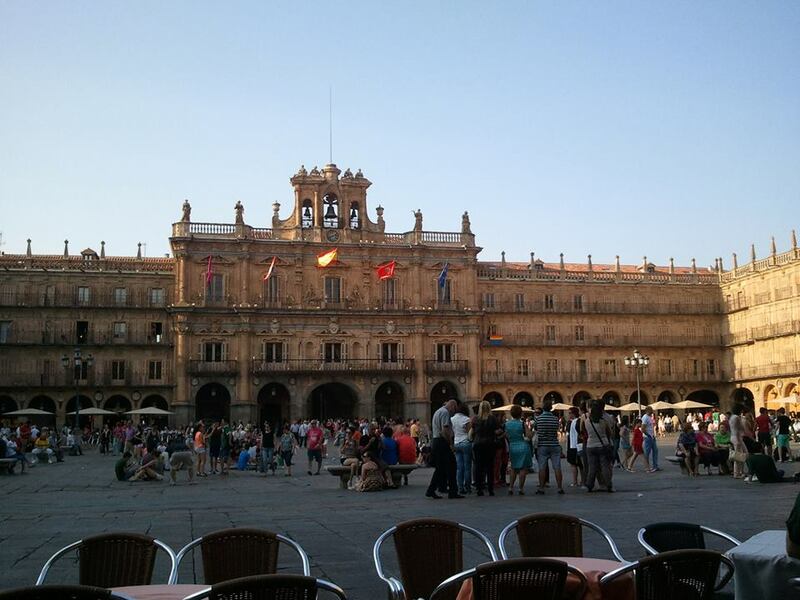 The picture above is a a view of the famous Plaza Mayor during the day—a place full of restaurants and cafes, and always full of people. And after you eat, you might want to walk it off by heading down one of the beautiful streets or simply admiring the architecture. After 5pm, good luck finding a place to eat. Restaurants close. Until 9pm, that is. And many stay open until 2am. 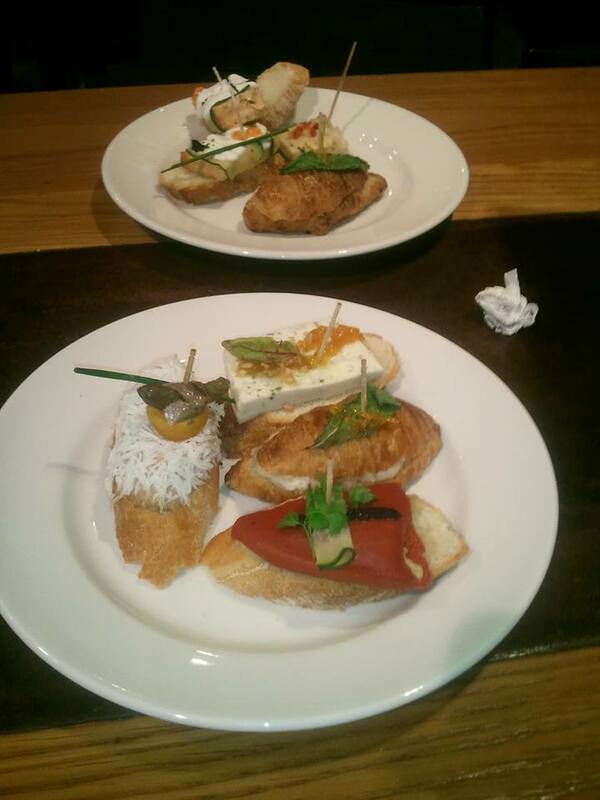 It’s tapas time! Yes, the awesome, unique tradition of eating small plates of delicious and fresh seafood, hams, cheese, vegetables with delicious, fresh bread and incredible wine. Tapas, and the fellowship of people simply gathering together to sit and talk, lasts well into the late hours of the night. 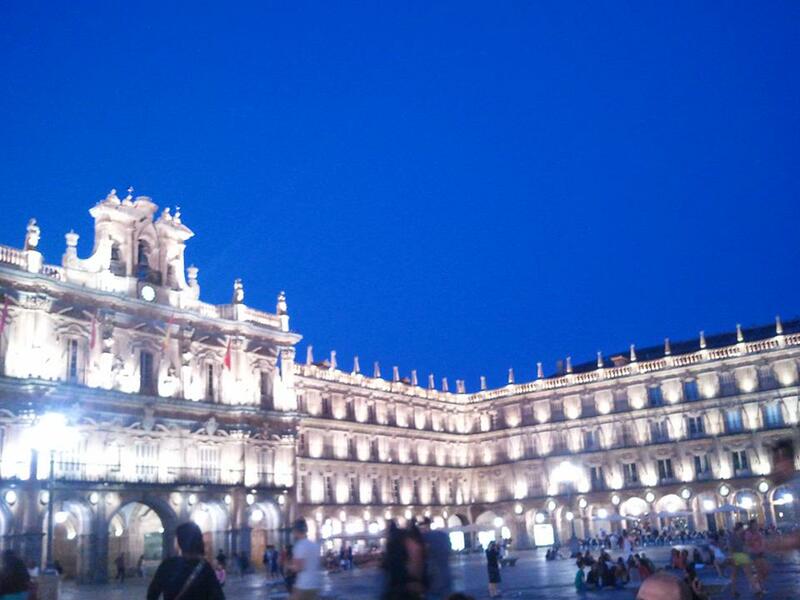 In Salamanca, you can easily forget what time it is, for at 10pm [or later] the sun is still out. And as I quickly learned, children were still at play. You see, in Salamanca, it is common to see a group of kids playing soccer in the street late at night. 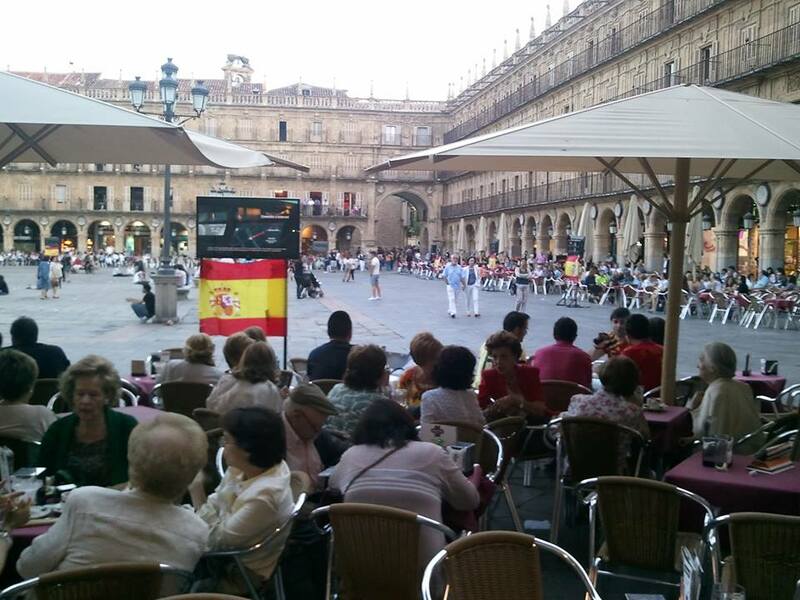 It is common to see parents or grandparents with infants or toddlers eating tapas in the Plaza well into the night. There is a strong focus on sitting down to share food and fellowship—for all ages. 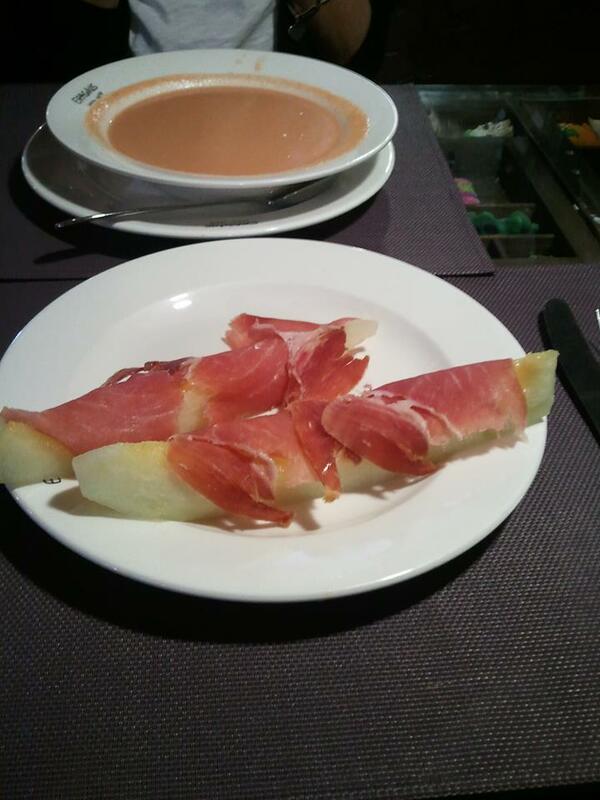 Unfortunately, there are some [mostly in the U.S. and some parts of Western Europe] who criticize the amount of time that Spaniards take to rest, eat, and fellowship. Shouldn’t they be working? Honestly, they do work—just as much as we do in the U.S., but they also stop to play. The tale of Mary and Martha is a short story about balance, and for some, a confusing story. Martha, the diligent, hospitable, hard-working person is wrong? How? And Mary, the sister who left Martha with all the work, is better? How? It’s a story about siblings. Anyone who has a brother or sister knows how this goes. Often, parents present us siblings with choices. And the parents, quite often, may try to influence us by saying: make a better choice. That better choice ranges from eating all your vegetables and not regurgitating them and then hiding them in your napkin to saying I’m sorry to your sister rather than nah, nah, nah, nah…ppfffhhttt! But siblings, more often than not, do not make the same choices. Jaclyn’s favorite color is green but Juliette’s is pink. Jimmy chooses to listen to a certain kind of music while his two sisters prefer something else. In my house, my brother and sister and I were often presented with this choice: what do you want to eat tonight? My sister: stuffed green peppers with rice. My brother: spaghetti with no sauce. Parents: when would you like to visit grandma and grandpa? Brother: will there be spaghetti involved? With no sauce. What should we make them for dinner? Which part of the house do you want to help clean? That’s really what happened with Mary and Martha. Guests were on their way. So Martha chose to dedicate her time and energy to prep. Martha chose to clean, cook, and prepare for guests. Not a bad choice at all, actually. Great hospitality. Martha’s hospitality choice wasn’t the problem. The problem was in Martha’s reaction to Mary’s different choice. You see, Mary chose instead to sit at the feet of their guest, Jesus. Rather than cooking and cleaning, Mary chose to listen to what Jesus had to say. Now, Martha wasn’t happy with Mary’s choice. She was jealous. Martha complained. Lazy Mary. Leaving me to do all the work. Look at her. Sitting at Jesus’ feet. Who does she think she is anyway? Martha must have felt overwhelmed, stressed out, weighed down by heaviness. She certainly was not at peace and at rest as Mary was. Maybe that’s why she got mad. Mary was able to rest, to just simply sit and listen. Martha wasn’t. Sound familiar? In the U.S., people live at a breakneck speed. It’s one activity to another activity to another. It is almost encouraged in this culture to accomplish every task on your list, and oh by the way, if you finish the tasks on your list, you better fill that extra time with something else that you should be doing! Sitting, resting, taking a break? Impossible! Lazy! But the story challenges this. Jesus, you see, also wanted Martha to experience rest. But Jesus understood that like many of us, Martha was caught up in a busy and “important” life. Often we claim that our work, projects, calendars, appointments, and tasks are so important. And when we see Mary so care-free, playful, curious, at rest—we resent her. I see Mary as a child in this story. Jesus so often lifted up the example of children as a model for the adults to follow. Kids are more open, freer and less focused on the so-called important tasks. We say: I don’t have time to play or to waste my time on such things. Can’t you see that I have work to do?! I’m not making Martha out to be the bad character in the story. I just think that this story is more about finding a balance. The balance is remembering that all of us are CHILDREN of God. This helps us to focus on the better thing—what actually is important. God wants our whole selves. God accepts us as we are. That should give us rest. That should give us peace. And this rest and peace ought to inspire us to be more like children—having the attitude that the work of our hands is important, but our lives are much more impactful if the work we do is balanced by joyful and free play mixed with rest—meaning no resentment, regret, or heaviness. I’m struck by how this story breaks stereotypes. First, Mary is a woman and her household is hosting someone, and she isn’t isolated in the kitchen. Second, she sits at the feet of a Rabbi [Jesus] and is taught. Rabbis in this time did not teach women. I find this story to be a continuation of Luke’s focus on the question: who is my neighbor? Jesus’ handling of that question turns the tables on the typical religious responses. A Samaritan is the hero and shows mercy when others don’t. A woman is the student and sits at Jesus’ feet; she does the better thing. Once again, we find Jesus calling attention to certain groups of people who are often left out or considered lesser. Samaritans, women, tax collectors, lepers, and oh yes—children. I hear the story telling us that kids have a lot to teach us. Unfortunately, kids are often looked at as immature or not ready for big and important things. Often the work of their hands is considered a nice, cute thing, but not nearly as important as what we adults do. But that just isn’t true. I have always believed [and still do] that kids have so much to offer the world [and us]. Their ideas, perspectives, and the work and movement of their hands are essential in the world. If we don’t pay attention to them, if we do not participate with them, we lose so much and risk losing the rest we desperately need to be alive; if we don’t embrace the lives of children, we risk missing out on a blessed teaching that could change our perspectives…for the better. The truth is, from Jesus’ time until now, I don’t think much has changed. We still single out certain groups of people and say that they are lesser. We still say that some deserve to be taught [educated] and others do not. We still say that certain people should always fill certain roles, no matter what. 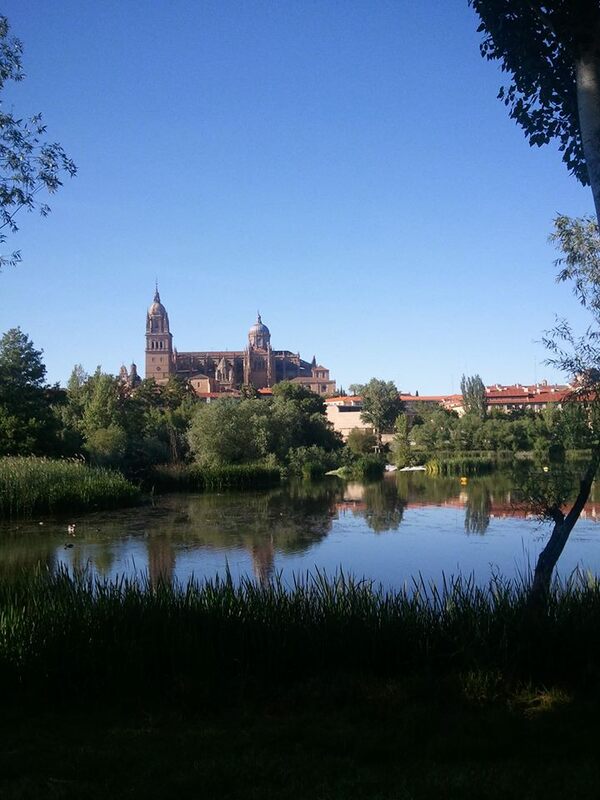 We still think that people in Salamanca might be crazy, unrealistic, or perhaps not hard-working. And then this crazy Jesus says the opposite. The better thing? Rest; sitting; listening. Children? Let them come and learn. The kingdom of God belongs to them. Unless you adults receive the kingdom of God like children, you won’t enter it. Why? Because kids get it! For them, it’s not about theology or creeds or doctrines or denominations or money or traditions. Kids want to be loved and accepted. And they want to learn. They are like human sponges for love and learning. If they feel loved and accepted by people who love and serve God, then the kids feel that this God loves and accepts them, too. If loving and caring adults teach them about Jesus’ love then the kids feel that the adults care enough to share this with them. And, if the adults choose the better thing and actually listen closely to kids—look out! Good things might actually happen. Changes might occur for the better. Because kids, cared for and loved and taught—are inspired to use their hands and feet, mouths, minds, and bodies to do good things in the world. And yes they can and yes they will. Often people say that cliché thing about how kids help us remember what’s really important. Well, it may be overused, but it is true. In our world, full of distractions, busyness, stress, and “important” work to do, we can easily get distracted and weighed down. We can easily neglect the moments of rest and peace offered to us. We can easily forget that we too are children. And we can easily miss opportunities for mercy-sharing, forgiveness, joy, and flat-out godly play! Look friends, we need to be balanced. Sometimes, we need to stop that “important” work we’re doing, sit down, and listen. What we can learn is that Jesus’ burden is light and the teaching is full of mercy and blessing. And as children [all of us], we can recognize that kids, youth, adults—we all have hands that can bless, forgive, heal, work for good, build bridges, plant trees and gardens, clap and lift up, praise and elevate, and clasp to join the hands of others. And this IS the better thing. So spend time sitting and resting. Don’t worship busyness and tasks. Listen to the merciful one. Be filled and refreshed. And then, Inspired by the rest and peace and teaching offered to you, inspired by the children around us, commit to living in this way. May the work of all of our hands make a lasting, blessed impact in the world. Amen.